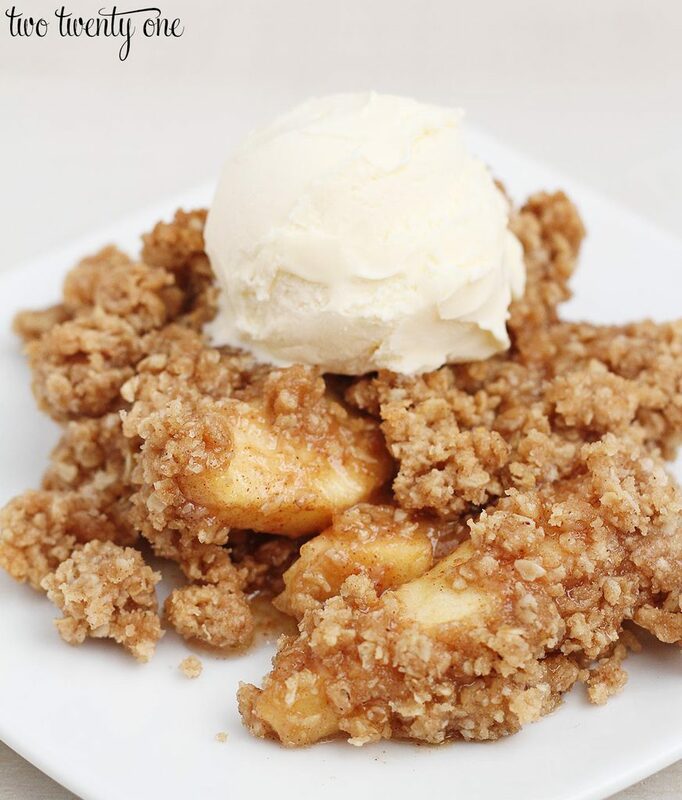 A few years ago I shared my family’s apple crisp recipe. It’s literally the most delicious apple crisp recipe ever. So, for fun, I decided to kick things up a notch and turn it into caramel apple crisp. If you’ve made the original apple crisp before, the topping, which is the best part of the apple crisp, hasn’t changed. It’s still soft but a little crunchy. 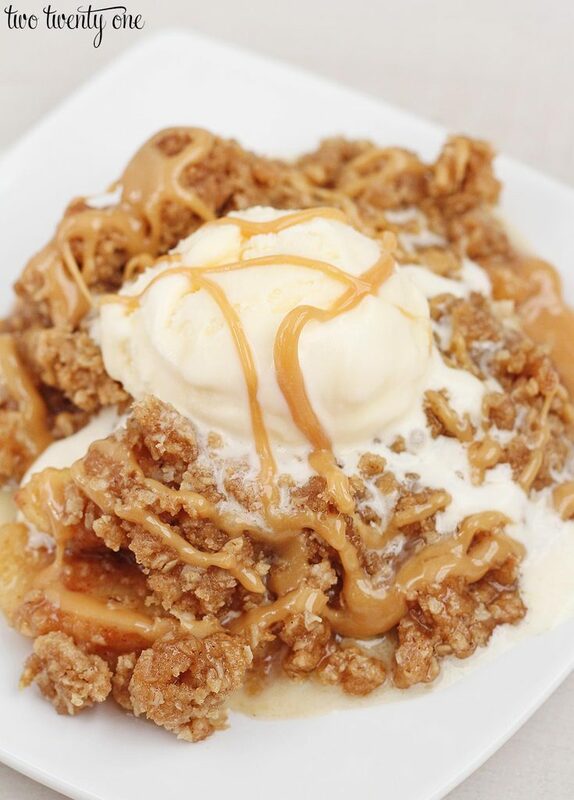 OMG, this caramel apple crisp amazing. 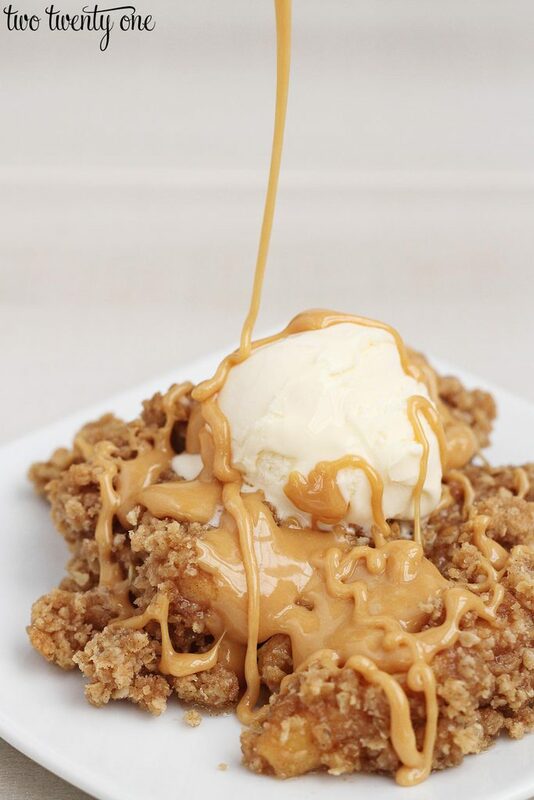 And it’s straight up out-of-this-world when you add ice cream and drizzled caramel on top. Can I just say how hard it is to drizzle and attempt to take photos at the same time? 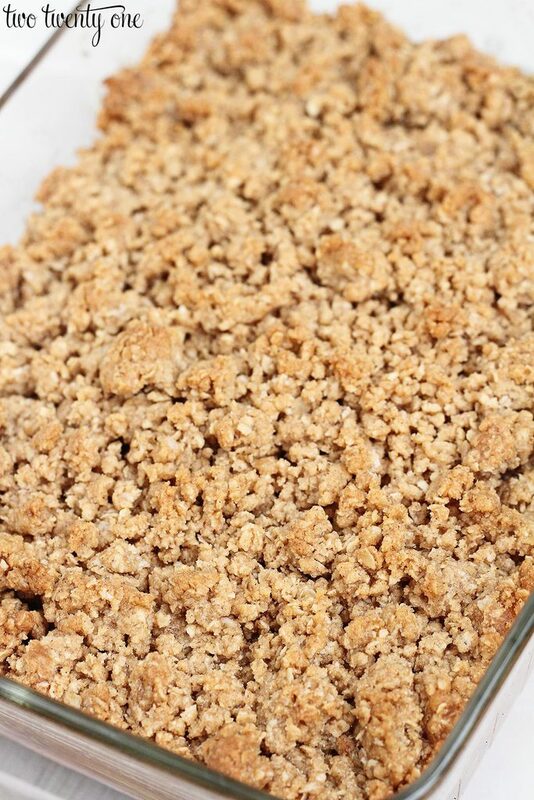 Seriously, imagine me crouching in my office, trying to accurately pouring caramel over apple crisp with my left hand, while snapping photos with my camera in my right hand. It got to point where I asked Brad to assist me and be the designated caramel drizzler. I think the pressure started to get to him because he asked if he could practice first. He even said, “Do you know how many times I’ve drizzled something over my food?” In case you’re wondering, the answer is never. I ended up photographing four, yes FOUR plates of caramel apple crisp in order to get a shot that didn’t look like the one below. I’m sure some people will be all, “Uhhh, I’d totally eat that.” But I hated how gloppy the particular plate below turned out. Here’s the recipe. Now, you can do a couple variations to the recipe if you want. You can add all 11 oz. caramels + 2 oz. of evaporated milk to the apple crisp (after heating it together in a saucepan) before adding the topping. Or you can make the caramel and evaporated milk at the same time, pour half over the apples before baking, and then reheat the caramel when it’s time to serve the apple crisp. I’ll leave all this up to you. Also, if you LOVE topping, double the topping recipe. Or if you LOVE apple, add another apple or two. Peel and cut apples into slices. Place in 2 qt. casserole dish. Add brown sugar and cinnamon, coating apples evenly. In a separate bowl, combine brown sugar, quick oats, flour, and cinnamon. Cut butter into dry ingredient mixture until crumbles form. Set aside. In a small saucepan, heat caramel and evaporated milk on low. Stir occasionally until combined. Pour over apples in dish. Sprinkle topping over apples and caramel. When ready to serve apple crisp, heat remaining caramels and 1 oz. evaporated milk on low. Stir occasionally until combined. Drizzle over apple crisp and ice cream. 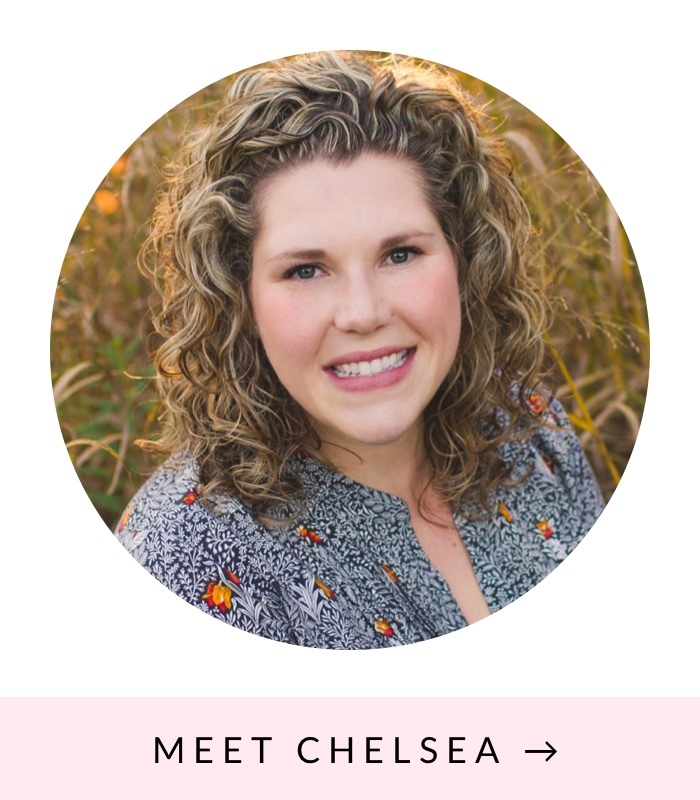 I’ve partnered up with 10 other bloggers to share some delicious recipes that are perfect for Thanksgiving. So make sure you head over to their blogs and check out their tasty creations! This looks delish! Do you have a particular type of apple that tastes best in this recipe? Or will any do? Love your blog, btw! I’ve been following forever, but I think this is the first time I’ve commented. Thanks so much, Mary Catherine! I like to use Golden Delicious, but Gala, Honeycrisp, or Cortland work too. Mmm…. this looks like it could be breakfast. I have always had a soft spot in my heart for apple crisp. Even apple pie doesn’t quite measure up, and it takes more work. What kind of apples did you use in your recipe? Thanks for sharing this recipe at Motivation Monday on Mom Home Guide! I’ll have to make this recipe for my kids! Did you use hard or soft caramel candies? Ok, so I thought I had the best apple crisp recipe but once I read the recipe I had to print it. I have some apples to use up! Thanks! Trying this this week. Hi! I came across on pinterest and can’t wait to try it! Would a 13×8 glass dish be too big?